New customers to our shop, often mention that they're looking for something to help themselves, a friend or a relative who's suffering with a skin problem. More often than not, it's eczema or sensitive skin that's the problem and they'll describe how the skin may feel sore and irritated or dry and cracked, and itching like crazy! We know exactly how that feels, so we’ll try to explain why we think our handmade natural goats milk soap and natural skincare products can really help. We have to go back to how we discovered the benefits of using natural products ourselves. As we explain to visitors to our shop, it all started with a trip to Canada where we stumbled upon a small shop selling handmade soaps. We bought some soaps because they looked so pretty, but what we didn't realise at the time was the soap would be good for our skin! During our holiday we used the soap and noticed that after a few days there was noticably less irritation and itching. We didn't put two and two together at first, but gradually realised that it was the removal of our usual bottle of body wash that was making the difference to the eczema and skin sensitivity. Needless to say, we came back to the UK with quite a few bars of soap in the suitcase, and over the months we used up our supply! But we then had a problem, since we couldn't find anything in the UK that was as good as our holiday soap - in the end, we had to make our own. Our Goats Milk Soap page gives more information about how we worked on perfecting our special soap recipe and explains why goats milk seems to help sensitive skin. Part of the reason why it took so long to develop our formulation (apart from us being perfectionists! ), is that we researched cosmetic ingredients and found much to our dismay that so many commercial products contained lots of synthetic detergents and not so pleasant ingredients. Now for many people this isn't a problem, but for anyone with sensitive skin, dermatitis, eczema or psoriasis these ingredients can lead to skin irritation. This is where the scratch-itch vicious circle begins, since the ingredient sets off the skin and once you start to scratch you can't stop! Another problem with some ingredients is that at first you won't experience any problems, but over the years the intolerance builds up until one day a product you thought was ok to use will suddenly cause a reaction. Then if the skin is damaged by repeated scratching, it may become infected and quite often it will take a course of steroid creams and antibiotics to calm things down again. We believe the answer is to remove the irritants wherever possible - and this may mean removing trigger foods from the diet and using skincare products with more benign ingredients. So it’s no accident that our handmade natural skincare products contain a very high percentage of natural botanical oils and butters compared to many commercial products. Our research convinced us that it was the removal of the irritants which was crucial for managing eczema and sensitive skin. Note that we say managing, not curing the skin. If you already have sensitive skin, the chances are that you'll always be prone to break outs (although some people do have fewer problems when they're adults, compared to the terrible eczema they experienced as a child). But by using more natural skin care products which reduce the chance of irritation, there's less chance of the skin feeling itchy, so there's less scratching and infections. This is where our handmade natural goats milk soap has really helped us, since it allows us to clean the skin in a very mild way and it doesn't strip away the skins natural oils. We then use emollients such as organic shea butter and pure botanical oils (available on our Natroma website) to add moisture to dry skin patches (emollients help to maintain fluids in the skin and encourage skin healing) and the result is a much more balanced and healthy skin, that's not so dry and is definitely less itchy. We've also been conducting user tests with Tamanu oil, and have found that because this botanical oil has anti-bacterial properties it can very helpful when dealing with irritated skin. For dry, scaly skin conditions then heavier botanical butters are more effective with maintaining skin moisture and help to encourage a smoother skin texture when applied regularly. But what should you do when you have an eczema or sensitivity flare up? This can happen even when you try to use natural skincare products - perhaps due diet changes, a new washing powder, a different perfume or perhaps a household cleaner etc. We'd suggest that you go back to basics, and if your doctor has presecribed steroid cream then use it. The important thing is to encourage the skin to calm down as quickly as possible, so be vigilant with food, make sure you're drinking enough fluids and use very mild unscented skin care products for a while. Then once the skin has calmed down, you may be able to reduce the steroid cream use and manage things more naturally again. We'd suggest that sensitive skin sufferers also begin to look at the ingredient listings on any cosmetic products that are purchased, and try to avoid any that contain synthetic detergents or harsh ingredients that have a proven history of causing skin irritations. 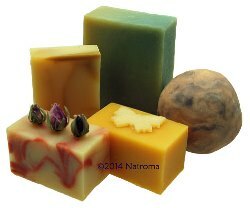 Our natural cruelty-free ingredients are shown on our Natural Ingredients page and if you're tempted to give handmade goats milk soap a try, then visit our Goats Milk Soap page. We hope this information has been helpful!